November 28, 2018, Adrian, Michigan – Go to the peripheries, wherever that is. Be in the peripheries, whether in an institution or on mission and offer loving accompaniment to those you find there. That was the message that Father Bruno Cadoré, Master of the Dominican Order, sent to the Adrian Dominican Sisters, Associates, and Co-workers assembled in St. Catherine Chapel on November 26 – and those who were watching through broadcast or live stream. But that message of challenge – as well as support, encouragement, and affection – was conveyed on Father Bruno’s behalf by Father Christopher Eggleton, OP, Socius for the United States. Father Bruno’s plans to visit the Adrian Dominican Sisters were changed abruptly when he was prevented from entering the United States. 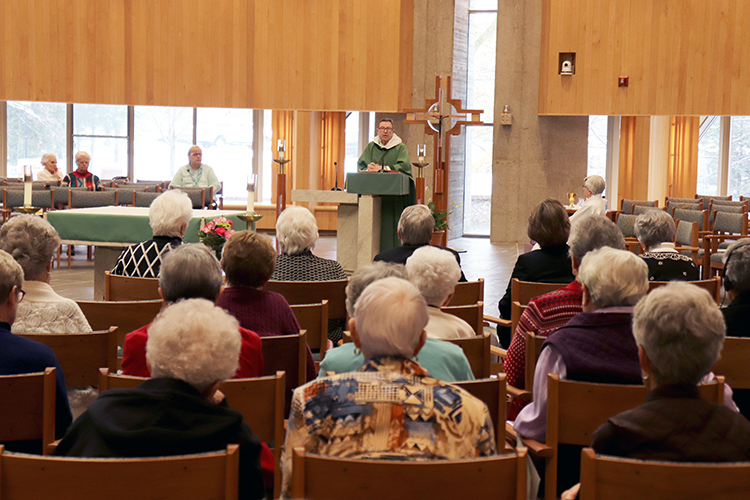 Sisters, Associates, and Co-workers crowd into St. Catherine Chapel November 26 to listen to a talk by Father Christopher Eggleton, OP, Socius for the United States. Father Bruno was represented by Father Chris, a member of the St. Martin de Porres (Southern) Province, and Father Louis Morrone, Vice Provincial of the St. Albert the Great (Central) Province. Father Chris emphasized the need for unity among all members of the Dominican family: friars, nuns, sisters, laity, and associates. “We remember always that we are sisters and brothers in Christ and St. Dominic and St. Catherine and the living saints in Dominic, as is our call,” he said. As a united family, he encouraged he Sisters to “go to the peripheries,” to evangelize all people who are on the margins or in some way left out of the care of society. “I tell you now on Father Bruno’s behalf that he loves you – we love you,” Father Chris told the Adrian Dominican Sisters and Associates. He added that Father Bruno is appreciative of the many decades that Adrian Dominicans have been serving people on the peripheries. 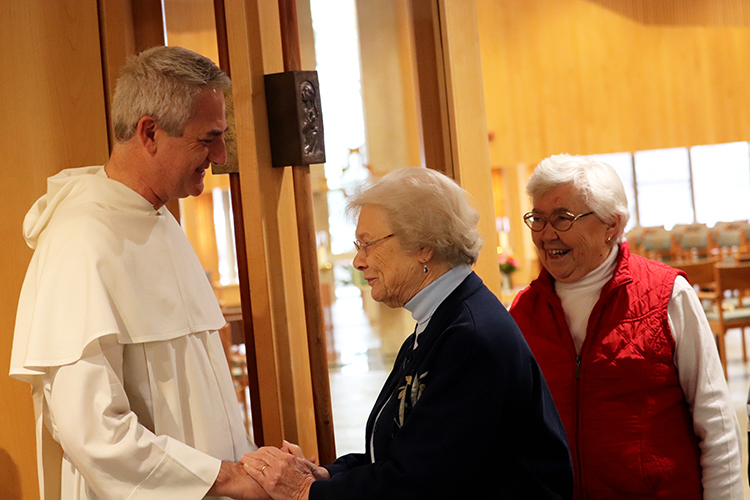 Father Louis Morrone, OP, Vice Provincial of the St. Albert the Great (Central) Province of Dominican Friars, greets Sister Maria Goretti Browne, OP, while Sister Josephine Gaugier, OP, waits her turn. In his homily during the Mass that followed his talk, Father Chris continued with the theme of ministering at the periphery and finding mission wherever you are. He told the story of a young man, Jonathan, who he had met on Death Row for murdering two young men. Through the presence of Father Chris, a Franciscan chaplain, and a chapter of Dominican Laity who served at the prison in Texas, Jonathan converted to Catholicism and became a member of the Dominican Laity. He began counseling other prisoners, listening to them, and accompanying them to their executions. Founded in 1206 by St. Dominic de Guzman, the Order of Preachers (Dominicans) minister throughout the world, on every continent except Antarctica. The Dominican family includes Friars; cloistered Nuns; apostolic Sisters; Dominican Laity, who are associated with the Friars; Associates, who are connected to individual Congregations of Dominican Sisters; and special groups such as Dominican Young Adults, Dominican Volunteers; Dominican High School Preachers; and Dominican College Preachers. 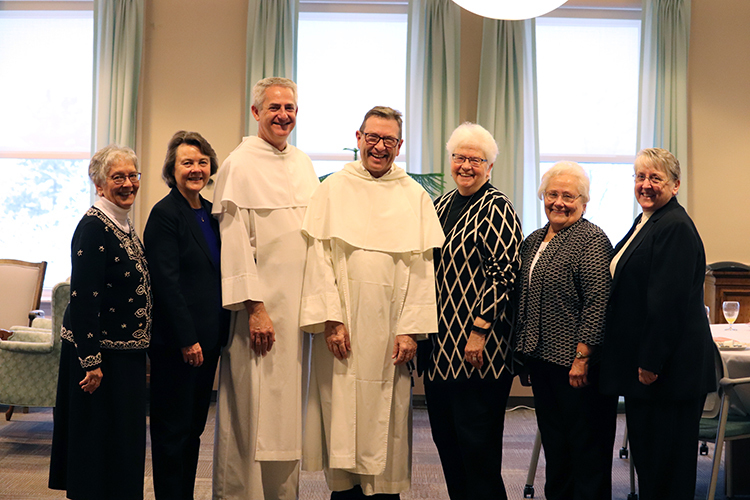 For information on becoming a vowed Adrian Dominican Sister, contact Sister Tarianne DeYonker, OP, 517-266-266-3532 or tdeyonker@adriandominicans.org or Sister Mariane Fahlman, OP, 517-266-3537 or mfahlman@adriandominicans.org. For information on becoming an Adrian Dominican Associate, contact Mary Lach, Director of Associate Life, at 517-266-3531 or mlach@adriandominicans.org. Feature photo: Father Christopher Eggleton, OP, Socius for the United States, speaks to Adrian Dominican Sisters, Associates, and Co-workers on behalf of Father Bruno Cadoré, Master of the Order. From left, Sister Patricia Harvat, OP, and Sister Elise García, OP, General Councilors; Father Louis Morrone, OP; Father Chris Eggleton, OP; Sister Patricia Siemen, OP, Prioress of the Adrian Dominican Congregation; Sister Mary Margaret Pachucki, OP, Vicaress and General Councilor; and Sister Frances Nadolny, OP, Administrator and General Councilor.